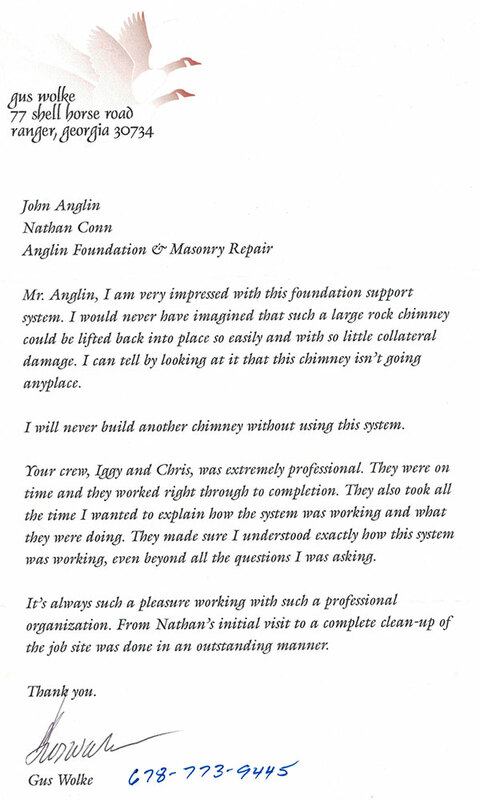 Mr. Anglin, I’m very impressed with this foundation support system. I would never have imagined that such a large rock chimney could be lifted back into place so easily and with so little collateral damage. I can tell by looking at it that this chimney isn’t going anyplace. I would never build any chimney without using this system. Your crew, Iggy and Chris, were extremely professional. They were on time and they worked right through to completion. They also took all the time I wanted to explain how the system was working and what they were doing. They made sure I understood exactly how this system was working, even beyond all the questions I was asking. It’s always such a pleasure working with such a professional organization. From Nathan’s initial visit to a complete clean-up of the job site was done in an outstanding manner.